Eco Caminhos offers a free apprenticeship for disadvantaged youth in Brazil, providing teenagers with vocational training in bioconstruction, organic farming, permaculture, renewable energy, ecotourism and hospitality at our eco farm in the beautiful mountains near Nova Friburgo, Rio de Janeiro.You or your organisation can sponsor a teenager in our programme and follow her/his progress closely. Please contact us if you would like to make a contribution. Brazil’s education system is failing. An important flaw is it’s bifurcated (private-public) nature. While the number of schools has increased and access has improved in recent decades, in general the quality of public primary and secondary education is still poor. This primarily affects the poorer segments of the population. Given that Afro-Brazilian poverty rates are twice as high as those of white Brazilians, black children are affected disproportionately. Most poor Brazilian children attend public schools, which are free, but often lack decent buildings, quality teachers, and teaching materials, especially in peripheral areas. In combination with precarious living conditions, expectations to contribute to family livelihoods, and the failure of basic education to relate to their social context, this makes it more likely that children drop out at an early age. The students that do finish high school and want to continue their studies need to take a highly competitive admissions exam to get into the best – public and free – universities. Competing with wealthier students who have enjoyed a high quality private education, only the lucky few make it (sometimes with the help of quotas). What is left for the others are the expensive (and lower quality) private universities or the job market. In their job search these teenagers are often faced with racism and discrimination, plus they are offered only low-paid jobs unless they invest in quality vocational courses. Bart Bijen, the owner and director of Eco Caminhos, ran an orphanage in Brazil for six years and is well aware of the disadvantages this system creates. In Brazil, young children in poverty still gain some sympathetic attention; as teenagers lacking opportunities they are seen as criminals even before they commit the first crime. Teenagers without an education are often neglected by the government and by society at large, they face racism, discrimination and have little opportunities in the formal labour market. In our experience it is important to offer these teenagers an alternative pathway, which is why we have developed the Eco Caminhos apprenticeship programme. At Eco Caminhos we believe that education is the best way to improve people’s lives and to create a more equal and safe society. We do not want to sit back and wait for the government to take action, even though we realize that we alone cannot solve Brazil’s deep societal problems. We hope to set an example by offering a high quality vocational education programme for Brazilian teenagers and by making this initiative central to our organisation. Eco Caminhos invites motivated teenagers to join us and take part in an apprentice programme of choice in bioconstruction, organic farming, permaculture, renewable energy, hospitality or ecotourism. We offer an all-inclusive 1 – 2 year vocational training programme. Providing accommodation, healthy food, vocational training, school support, evening school, and organising activities such as sports, hikes, game nights, and camping weekends. In addition to learning a profession, the teenagers will grow in self-confidence as they are stimulated to follow their dreams. To work at a beautiful eco farm in Brazil. To learn about permaculture, bioconstruction, organic farming, eco tourism, hospitality, languages. To be guided by people who have over 10 years of experience working with youth. Providing motivated youngsters the opportunity to learn a vocation in all Eco Camihnos areas. 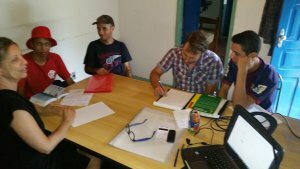 To finish their education: In case teenagers don’t have a primary /secondary school diploma, Eco Caminhos makes sure they enrol in evening school, while providing additional educational support. To lead a healthy life: we provide teenagers with healthy organic food, stimulate the practice of sports for health and stimulate team-building. Vocational, traineeships and job opportunities outside of Eco Caminhos for those who have proven to be motivated and sufficient educational basis to learn. At Eco Caminhos we have come to understand that disadvantaged teenagers can only participate in our apprenticeship program if they get a small stipend. We offer R$500 per month so that they can pay for transportation, visit their families, or send part of the stipend to their families, who often live in poverty. Once Eco Caminhos becomes profitable we want to invest 25% of the profit in educational projects, to cover all investments (including these stipends) and further develop our social projects. Eco Caminhos’ criteria for selecting a teenager for our apprenticeship programme are simple: The teenager should be motivated and in need. We use our network to contact orphanages, NGOs or schools in poorer areas of Brazil and ask those organisations to refer teenagers that have shown excellent behaviour and motivation We first want to help those who really want something in life but lack the opportunity. Educational level is irrelevant to us, all that matters is motivation and respect. We then have an interview, visit their homes and talk with their parents / caretakers. If the teenager is eager to join the programme and we come to an agreement, we first do a test week and month to see how it goes. It is important to understand that not all teenagers will succeed in the programme. Although success cannot be guaranteed, we do believe that, because of our personalised approach, the success rate will be high. With R$ 6000 (appr. 1800 USD) per year (a R$500 -or $150- stipend per month) we are able to invite a teenager. All other expenses such as accommodation, food, school support are covered by Eco Caminhos. An organisation, individual or group of people who decides to support a teenager will have the opportunity to follow the progress of this teenager closely. We will send reports and facilitate chats between the teenager, the programme coordinator and the sponsor to monitor progress. If you are interested in supporting a teenager, please contact us.